Back in June there was a crane on top of the new World Trade Center in New York. The building wasn't finished, but was already like 400m tall. Maybe the crane is still there. Anyway, I do not understand how they are going to get the crane down. Do they take it apart and bring it down in a lift? Or do they just build around it for the top few floors so the crane if forever trapped? Or do they use another crane to lower it down? If so, how do they get the second crane down? I'm really worried about that poor crane. More generally, are there any good pop articles that go into the logistics of building really tall buildings? The cranes build themselves, and remove themselves by reversing the process. Here's a timelapse of a crane building itself and another of a crane removing itself. Basically, the top of the crane has a cage ('climbing frame') that fits over the main part of the tower. The crane can raise itself so that the cage is supporting it, with the main tower below. Then the crane lifts up a new section of the main tower, and this is inserted into the cage. That section becomes the new top of the main tower, the cage raises again to create another gap, and the process is repeated. Here's a good illustration: climbing attachments. Removal of the tower is achieved by doing the opposite. With a structure about 10 floors tall, I saw a rather large crane placed and later removed from the roof of the building by a really giant crane that occupied the full width of E. 67th St. in NYC. One of the tower cranes will disassemble the other one and will take it down. Then the same crane lifts up a smaller one called a derrick crane, once the derrick's installed, this one will disassemble its predecessor (one of the tower cranes) and will take it down. 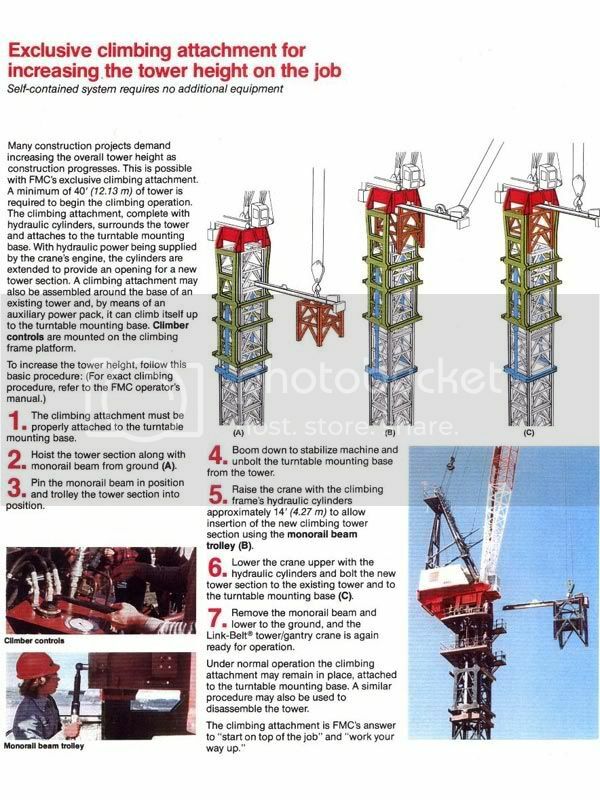 Finally the BMU (building maintenance unit) will take derrick crane once everything's done. I'd expect helicopter assembly to play a role. Actually, all of the above, plus: sometimes they don't. Some cranes are removed by helicopter. Some use assistance. And some are left in place. The cost of the crane is insignificant compared to the cost of the building, and if the air conditioning unit ever needs major repairs, the crane is ready to serve.